Jacob Turner made his Major League debut this afternoon, just one season away from pitching in Single-A with the Whitecaps, and two seasons out of high school. Turner is the 15th ranked prospect in all of baseball right now, so this shouldn’t be too much of a suprise to those who’ve been following his career. He didn’t disappoint, either, only giving up two runs against the talented Angels over 5 1/3 innings. He gave up three hits, walked three, and struck out six. Unfortunately, he took the loss, thanks to the efforts of Tigers relief pitcher Phil Joke Coke. Turner recieved a standing ovation from the sold-out crowd at Comerica Park for his efforts. The 20-year-old right-hander also impressed his manager as well as the Tiger fans in attendance and watching him on TV on Fox’s Game of the Week. “I thought he’d do well,” manager Jim Leyland stated. “I wasn’t sure he’d do quite as well as he did, to be honest with you. But I thought he’d do well. Turner gave the Tigers a chance to win the game, but the thanks to the anemic offense and the struggling bullpen, he took the loss. He didn’t stay with the Whitecaps too long last season, so we didn’t get a chance to see him pitch down there. He was 2-3 with a 3.67 ERA, and 50 strikeouts with West Michigan in 2010. I look forward to seeing him on the mound in Detroit in the future. The Detroit Tigers traded Charlie Furbush, Casper Wells, Francisco Martinez, and a player to be named later to the Seattle Mariners for starting pitcher Doug Fister and relief pitcher David Pauley. Martinez is the Tigers 4th ranked prospect, but thought to be expendable due to Nick Castellanos’ progress in West Michigan. The move gives the Tigers a solid number five starter and beefs up the bullpen at bit. It also give Furbush and Wells a chance to be Major League players in Seattle. So far this season with the Tigers, Furbush is 1-3 with a 3.62 ERA in 17 appearances. 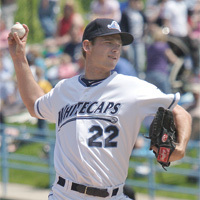 With the Whitecaps in 2007, he was 4-1 with a 2.17 ERA and 46 strikeouts. Wells started the season with the Tigers, batting .257 with four home runs in 64 games before being optioned to the Toledo MudHens (Triple-A). In 2008, Casper batted .240 with ten home runs in 50 games with West Michigan. I wish them both the best with their new club. They can join former Whitecap pitcher Luke French who was traded to the Mariners in 2009 in a brilliant move that brought pitcher Jarod Washburn (who?) to Detroit. Glad to see Turner get some respect… and how cool that you knew him when he was a Whitecap! Ah, the perks of supporting a minor league team. I thought it was an odd decision to put Coke in myself, not that I was complaining any. 😉 Turner definitely impressed, with his cool under pressure as much as with his stuff and his location. I expect to see a lot more of this young man in the seasons to come. Jeff-unfortunately, he was a Whitecap very long. He was too successfull and he’s moving up fast.